Beats S.t.u.d.io.3 Wireless Bluetooth Built In Mic Over Ear Headphones in Matte Black with Carrying case:Premium sound with fine-tuned acoustics and Pure ANC Beats Studio3 Wireless headphones deliver a premium listening experience with Pure Adaptive Noise Cancelling (Pure ANC) to actively block external noise, and real-time audio calibration to preserve clarity, range and emotion. It continuously pinpoints external sounds to block while automatically responding to individual fit in real-time, optimising sound output to preserve a premium listening experience the way artists intended. 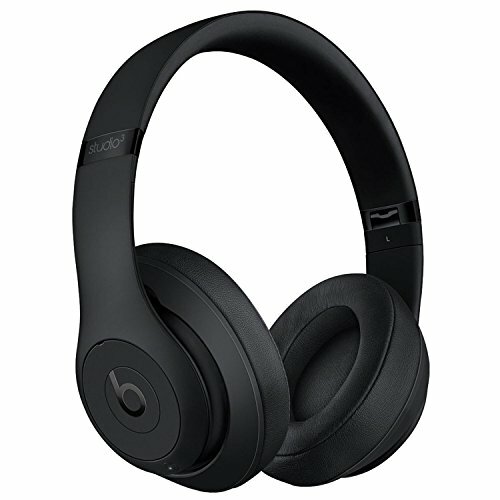 Driven by the Apple W1 chip Beats and Apple are changing the way you listen to music with the Apple W1 chip in Beats Studio3 Wireless headphones. Incorporating the efficient W1 chip brings seamless setup and switching for your Apple devices,* up to 22 hours of battery life for all-day fully-featured playback with Pure ANC on, and Fast Fuel technology for 3 hours of play with a 10-minute charge. Pure ANC-off for low power mode provides up to 40 hours of battery life. *Requires iCloud account and macOS Sierra, iOS 10, watchOS 3 or later versions Stay connected. Stay in the zone. Take calls, skip songs, control your volume and activate Siri using the convenient multi-function on-ear controls. The Apple W1 chip offers Class 1 Bluetooth® connectivity to seamlessly sync to your devices, so you can easily move about, keep the music going and stay productive all day. Designed to fit you The Beats Studio3 Wireless headphone is designed for long-term comfort to match its impressive battery life of up to 22 hours for all-day play. The soft over-ear cushions feature advanced venting and signature ergonomic pivoting for a custom, flexible fit for any head shape. The holistic design is lightweight, durable and comfortable, so you can get lost in your music. Real-time audio calibration preserves a premium listening experience.Pure ANC-off for low power mode provides up to 40 hours of battery life. If you have any questions about this product by beat_by_dre, contact us by completing and submitting the form below. If you are looking for a specif part number, please include it with your message.